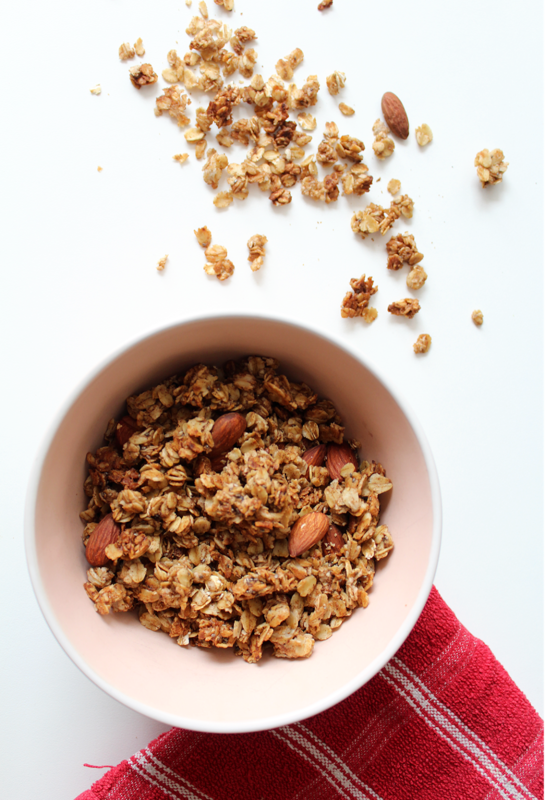 HOMEMADE HEALTHY GRANOLA | RAWR BOWS. 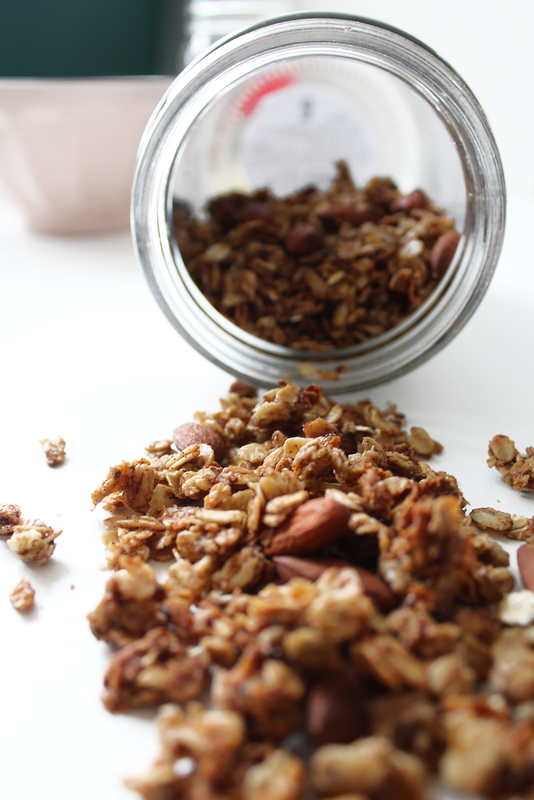 I love granola - it is my one true love in life. I have it for breakfast, lunch, dinner and everything in-between. But you know what the problem with supermarket granola is? They are pure sugar and very overpriced - how much can one charge for some oats with nuts? 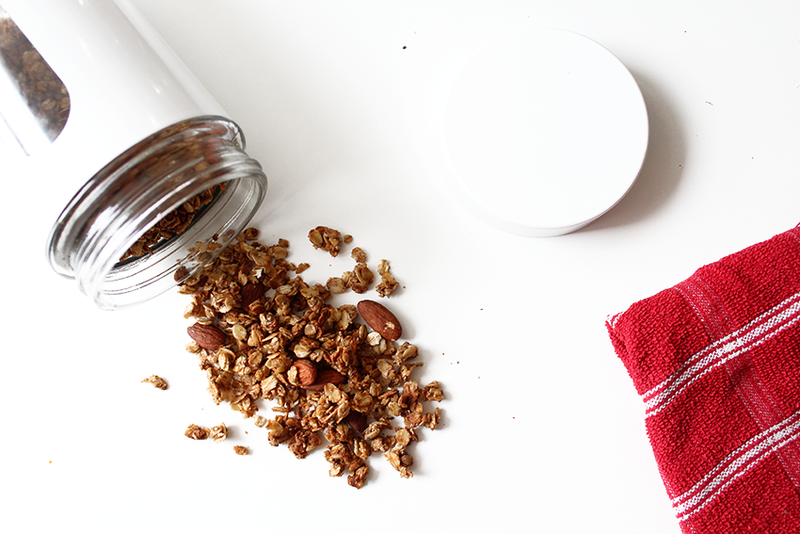 Making granola at home seems to be an increasingly popular trend, so I decided to join it. Now, I am not the best cook and I do tend to mess things up often but this is so easy not even I could mess it up. I didn't follow any exact recipe - I half asked my sister how she made it and used that as a guide and half added what I had around at home. I have made this a few times and I would like to think I am the granola queen now. This is by far the best granola I have had as I get to only add what I like and I am not stuck with boring sultanas or Brazilian nuts (which I hate). Before I even start making my granola, I like to toast my almonds by simply putting them on a tray and baking them at 50˚C for about 15-20min. Whilst they are cooling I put my oats on a baking tray. Depending on how muck granola I want to make I'll use more or less (duuuh). Then, I'll add loads of cinnamon, like honesty so much cinnamon it is a bit concerning. It is up to you how much you add, but if you are like me and are a big fan of the spice then I recommend adding loads as after baking it you can't taste it that much. I also add around half a teaspoon of nutmeg to add some more flavour, I am not very big on nutmeg but if you are obviously feel free to add more! Then I add around two tablespoons of chia seeds - you can't really taste them when eating the granola but they are meant to be very good for your health (and I accidentally bought loads so need to use them up...). Finally I add some honey, add more or less depending on how sweet you want it to be, and about a tablespoon of coconut oil. What these two ingredients do is bring the oats together and help them form a cluster. The easiest thing is to use your hands to mix it all together but you can also use a spoon if you are not into getting dirty. Finally, I add the lightly roasted almonds. And yes I do bake the almonds twice because I like them extra roasted to match my extra personality. Once everything is well-mixed, I bake it at 200˚C for 15-20min (keep an eye on it as it can burn very easily!) and then let it cool. I love dates so I alway chop up some dates and some dark chocolate and add it to the cooled down granola. I have made the mistake of adding it whilst it's still hot and the chocolate melts (obviously) and makes such a mess! So learn from my mistakes. This has literally been my favourite thing recently and it is so so so easy to make!